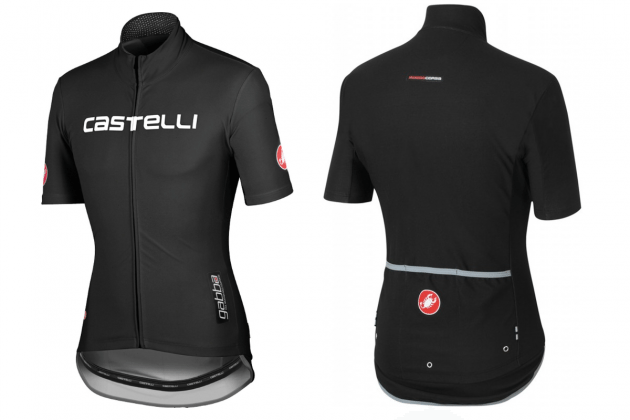 The Castelli Gabba WS Jersey will keep you warm, dry and aero. If you were watching stage 3 of this years Paris-Nice race you would have seen Andrew Talansky of Team Garmin-Sharp demonstrating the qualities of Castelli’s Gabba WS Jersey in the most emphatic way, by winning the stage. With rain and temperatures around 5°C, it was a perfect day for training indoors. Unfortunately riders in Paris-Nice didn’t have that option and so faced a day of flapping rain jackets; apart that is from Team Garmin-Sharp. With Castelli as co-sponsors they were able to field their ‘unfair’ advantage, the Gabba WS Jersey. The Gabba WS Jersey story began in 2009 with a group of Cervélo TestTeam riders working with Castelli to develop and improve clothing for cold and wet conditions. During one of these sessions, CTT rider Gabriel Rasch, nicknamed ‘Gabba’, came up with the idea for a stretchy, form-fitting short-sleeved rain jersey that could be paired with Castelli’s water-resistant Nanoflex arm warmers. It was a brilliant bit of thinking. Why, when riding several thousand pounds of aero bike and wheels, would you choose to then drape yourself in a flappy, wind grabbing rain jacket? You could leave the rain jacket behind and hope you finish before you freeze. The Gabba WS Jersey makes perfect sense. The Gabba is aero and breathable. Constructed from Windstopper® X-Llite Plus fabric, which gives protection from the wind and has a water repellent finish. An extended rear gives protection from road spray and silicon grippers on the waist band stop the jersey from riding up. Rear pockets have small eyelets at the bottom so all that rain has somewhere to go. Available in sensible fluro yellow or bad boy black the Gabba WS Jersey is available as a short sleeve for £120 or a long sleeve at £166. Watch the video below and listen to Team Garmin-Sharp wax lyrical about their Gabba jerseys. In this video be prepared to be amazed at the Gabba’s ability to repel water and retain it’s breathability.